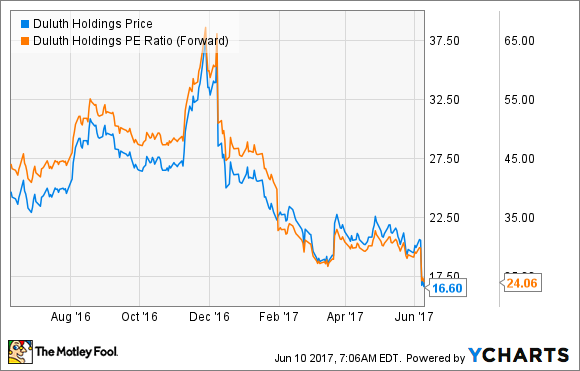 Why Are Duluth Holdings Investors Throwing in the Towel? Despite steady growth and accelerating expansion, investors are abandoning ship. What gives? When Duluth Holdings (NASDAQ:DLTH) delivered another solid quarter of results last week, I figured its stock might finally show some signs of life. But where I saw continued 20%-plus top-line growth, strong margins, and turbocharged retail expansion efforts, the rest of the world apparently was focused more on the company's rising expenses. And to be fair, first-quarter earnings per share (EPS) did fall 90% year over year, helping send the stock to a fresh 52-week low. However, this reduction in earnings was primarily the result of investments Duluth is making in marketing and building new stores -- neither of which came as a surprise. And with no change in the company's outlook or guidance -- plus the continued impressive performance from its retail stores -- the market may be overreacting. Twenty-percent-plus sales growth with steady margins. What else is new? Duluth's consistently impressive top-line growth continued in the first quarter, with net sales increasing 21.9%, to $83.7 million. Duluth noted that February started rather slow, as the company had limited clearance inventory during a month that's typically quite promotion heavy. However, sales gained momentum throughout the rest of the quarter, helping Duluth beat analyst estimates of $82.9 million. Additionally, gross margins rose to 58.1%, up from 57.8% last year, indicating that Duluth's pricing power isn't showing any signs of diminishing. Breaking down the sales mix, direct (online and catalog) sales grew 5.7% year over year. While this number is actually the lowest it's been since Duluth's IPO, a couple of other indicators point to a still-strengthening brand. Website visits were up 16.5%, roughly 200 basis points higher than last year. And the number of new customers grew 31% over last year. Duluth expects its direct sales to continue to grow in the mid-to-high single digits in 2017. While some may see this as evidence the Duluth brand's popularity is beginning to fade, I think we're seeing a savvy move by management. Duluth could increasingly rely on promotions and discounts to grow the direct side more quickly, but opting for more restrained growth in direct sales will help preserve margins, while still allowing the company to meet its overall top-line goals. CEO Stephanie Pugliese also stated that, in individual markets where a new store is opened, direct sales tend to decelerate during the first 12 months, then pick back up again. This suggests that, over the long term, Duluth's multi-channel strategy will result in incremental sales. Though Duluth's retail efforts are still in their infancy, its stores are already exceeding expectations. Retail sales grew 140% year over year, with the company noting that all stores are meeting or exceeding its $450 sales-per-square-foot target. Additionally, Duluth's stores continue to provide payback on initial investment within 24 months, and sport earnings before interest, taxes, depreciation, and amortization (EBITDA) margins in the mid-20% range. To say that Duluth's sales mix is undergoing a dramatic shift is an understatement. In 2015, retail accounted for just 12.4% of net sales. In 2016, that number jumped to 17.7%. And citing strong results across all store geographies, the company now believes that retail may account for 27% to 30% of total net sales in 2017. Duluth's previous guidance for 2017 included 10 to 12 new stores. On the earnings call, Duluth made good on its promises to accelerate its pace of expansion, saying it now plans to open 12 retail stores, plus one outlet store this year. This will increase Duluth's total store count to 29 by the end of 2017, which would represent annual store growth of more than 80%. While on the surface, Duluth's 90% reduction in earnings per share looks terrible, the expenses that drove this decline seem perfectly sensible. The company opened four stores in the first quarter (compared to zero last year), which reduced diluted earnings per share (EPS) by $0.04. It also launched a TV campaign -- a quarter earlier than it did last year -- to drive women's sales of its No-Yank-Tank, further reducing diluted EPS by $0.05. Adjusting for these two expenses alone, EPS would have been roughly flat. Taking the longer view, the picture here looks unchanged. Duluth reaffirmed its 2017 guidance -- including roughly 22% sales growth, gross margins of about 57% and adjusted EBITDA growth of around 18%. That said, over the next 18 to 24 months, the company will keep investing heavily in building out its retail presence, which will likely cause earnings to stay lumpy for a while. Given the strength of the brand and Duluth's long runway for retail growth, trading short-term earnings for faster top-line expansion looks like a smart strategy to me. For now, though, it's obvious that Mr. Market remains a lot more skeptical. Currently trading at around 24 times estimates of this year's earnings, Duluth is now cheaper than it's ever been by this measure. This seems like a time to buy, not sell.